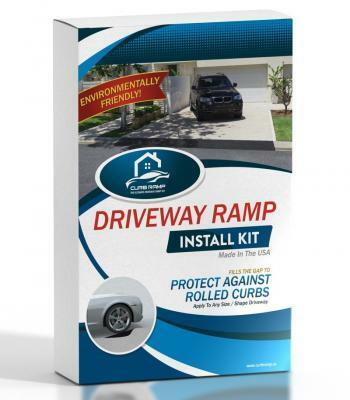 A standard Curb Ramp installation creates a powerful bond between the ramp, your driveway, and the street, making it a much more permanent solution than other pre-made driveway ramps. While conveniently mobile, pre-made driveway ramps rarely fit an individual’s specific curb well. But sometimes you want a removable ramp but don’t want to compromise with an expensive, ill-fitting pre-made ramp..
After you perform a dry run and confirm you have enough material for your particular driveway, lay down a protective layer over the curb surface (so as not to prime the curb surface directly) and tape it down around the edges. We recommend using a durable rubber membrane like a shower pan liner, rubber roofing membrane, pond liner or similar substrate. Next, prime the surface of the membrane to ensure a good material bond to the laid substrate. Then, mix and apply the Curb Ramp material atop the substrate to fill the curb gap as you would normally. After 48 hours, your customized Curb Ramp should be dry enough to use. The weight of the material and underlying substrate should provide sufficient stability to keep the ramp in place. If you need to remove the ramp for any reason, you can simply lift it up and move it. Sometimes the simplest solutions are the best solutions. While the bond created during a standard Curb Ramp installation is strong enough to last years, we understand some customers prefer the option to move their ramps. We hope you find this simple DIY solution useful.